I have migrated Windows from a real PC to a virtual machine and installed Parallels Tools inside it, but there is still no Internet connection and the network does not work at all. Additionally, video driver may not work and, as a result, Coherence and Dynamic Screen Resolution features do not work. "This device cannot find enough resources that it can use. 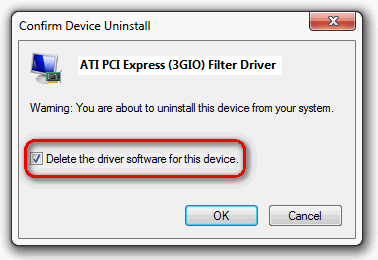 (Code 12)"
Find the corresponding driver, (in our example - "ATI PCI Express(3GIO) Filter Driver"), right-click on it and select Uninstall. Check and make sure that the driver has been deleted. If it has not, start again from the Step 3. If it has been deleted, reboot 1 or 2 more times and check if issue persists. If it does persist, please reinstall Parallels Tools: in Mac menu bar go to Actions > Reinstall Parallels Tools. All other necessary drivers (like Ethernet and USB) should be installed automatically after few Windows restarts. It can be installed even if you do not use ATI/AMD hardware on your computer as it is provided with Windows Updates. Those drivers take all available IRQ resources for system devices which is the reason why neither Parallels Network Adapter, nor Parallels Tools Device can be installed. Additionally, you may see the same error message on Parallels Video adapter and USB controllers.